Pathways includes the latest Queensland Work Experience agreement template as provided by the Department of Education and Training. As part of Pathways we include the latest state agreements in Pathways - in 2017 most states in Australia updated their agreements. These are provided in an open source template as it's very common for our customers to merge additional documents with their agreement or insert values directly into the form that don't need to be merged. 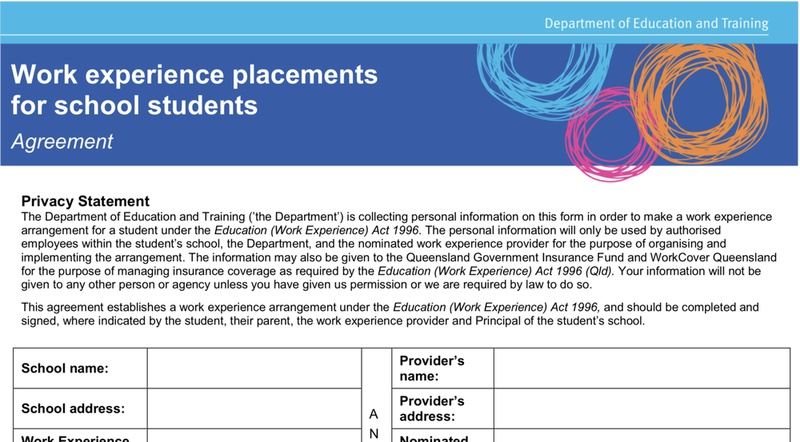 An example of this is a "Placement Pack" which is a single word template that contains the Queensland Work Experience agreement, a parent letter, a host letter, a placement details sheet and a feedback form all in the same "one click" merge.